A new development in viscosity testing equipment. This electromagnetic viscometer, the EMS-1000, features small sample viscosity determination, contact free tests and temperature controled processing. Tests are performed on a small sample ( 300µL or 700µL) contained in a disposable tube. These EMS-1000 features are achieved by an electromagnetic spinning method. Magnets are positioned around the sample tube to create a rotating magnetic field. This field moves a small aluminum sphere placed in the sample. Testing with the EMS-1000 requires no clean-up. Both the sample tube and aluminum sphere are disposable, so once a test is complete, all you have to do is throw away the sample tube. This is ideal for products which require testing in a sterile environment, and for preventing cross-contamination between products or samples. 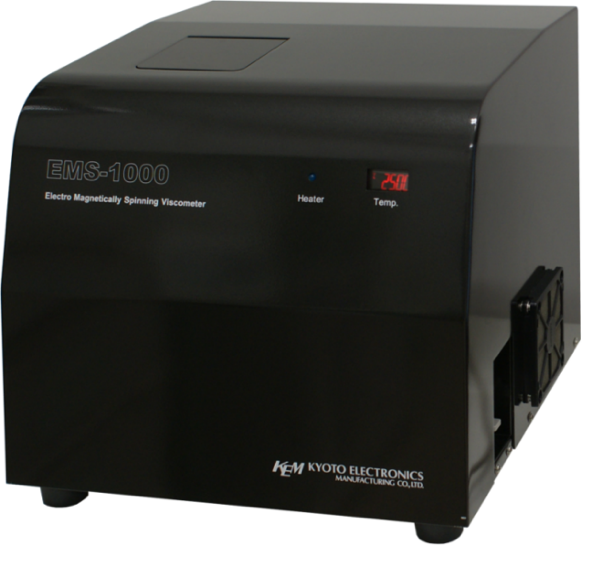 The EMS-100 provides temperature control between 0 to 200oC. Measurements can also be performed at elevated pressures. A CMOS camera lets you see what's happening to your product during the test, making it easy to observe coagulation or detect impurities. The sealed measuring cell equips the EMS-100 to accurately measure volatile, toxic, or air-sensitive samples.